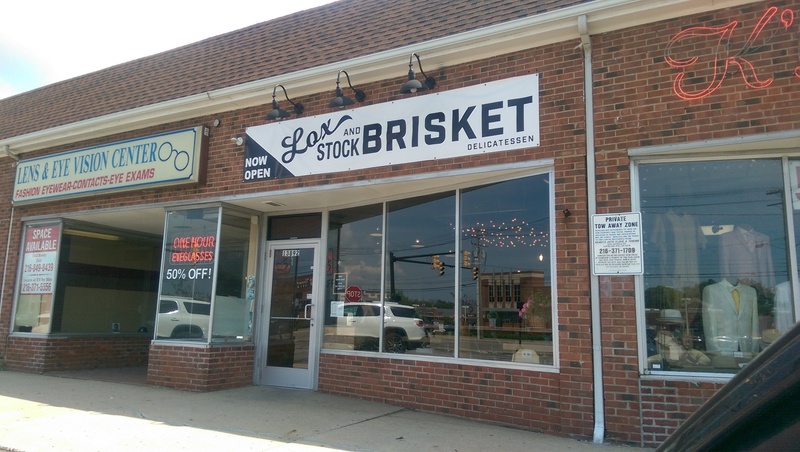 Lox, Stock and Brisket opened recently at Cedar Center in the old Ribsticks storefront. They did not have to do much with the place. It looks a lot like the old Ribsticks. There was another food service place there very briefly, but Chef Anthony Zappola and his family took over the lease. He heard about the smoker, so he decided to smoke meats and open a Jewish deli. He used to own a restaurant in Las Vegas called The Rice Shop, but he wanted to move home to northeast Ohio after living and working in numerous restaurants in several major cities. A Solon native, this spot truly is a family affair. His mother works behind the counter and makes the matzoh ball soup. They are very responsive with food allergies. One of my friends has a soy allergy, which limits her a lot. They were able to find something she could order and promised to use a different oil that isn’t soy-based in the future. How awesome is that?The menu revolves around smoked meats and dishes inspired by the neighborhood around it. They offer a good matzo ball soup (with chunks of celery, carrot and chicken), a lox platter with cream cheese, capers, chopped egg and chopped red onion, and a bunch of delicious sandwiches featuring brisket, smoked turkey, lox, tuna salad and a breaded chicken schnitzel. They make most everything in-house, including the smoked fish, lox, and pickles. 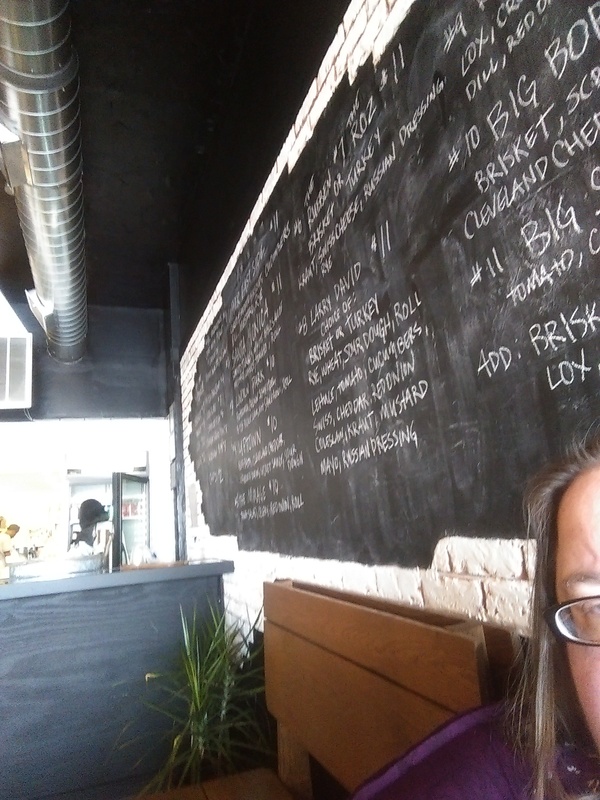 I heard about Lox, Stock and Brisket the day it opened and went to check it out the very next day. During the first visit I ordered the matzo ball soup, the Santa Monica and the potato salad. I love the matzo ball soup. It’s not just broth. There are chunks of carrot, celery and moist chicken in it. The smoked turkey on the turkey sandwich was moist, and the BBQ sauce and mustard were not too heavy. I absolutely loved the potato salad. It is a red skin potato salad and is perfectly creamy. On my second visit (the very next today) I went back to try the brisket. The “Rueben” is named after his childhood friend and features thick chunks of brined and smoked brisket, Cleveland Kraut, Swiss cheese and Russian dressing. As those who follow this blog know, I am not a fan of corned beef because it’s too salty and fatty in my opinion. This is now the ultimate Reuben for me – featuring a tender and flavorful brisket without too much fat or salt. It is now my favorite Reuben ever. The brisket is served in thick chunks of flavorful meat – not too fatty or salty (although one of my friends was less than impressed with it and reported that one bite had it coming out in one piece due to some gristle). The one I had was perfect. The Russian dressing and kraut on a nice rye bread were just right. I wasn’t as enthused with the coleslaw, but it was good. But I prefer a very creamy coleslaw, so my choice is subjective based on my tastes. I ordered the Roz (above left), which is the Rueben but with thick slices of turkey, on a subsequent visit. It was also a very good sandwich, with good slaw and cheese. I think I like the brisket more though. My friend with the allergies thoroughly enjoyed her Upper East Side. I can’t wait to try the rest of the sandwiches – the Lincoln Park buttermilk chicken schnitzel looks especially delicious (update: see photo on the right – don’t let the hot sauce aioli scare you. It smells like hot sauce but doesn’t taste like it. It’s divine and the most popular sandwich here). The lox was a nice smoked salmon, and it was a nice sized portion. I had stopped at Bialy’s beforehand to pick up a couple bagels to enjoy with it. The lox platter came with crackers, but frankly I ended up feeding them to the birds. I’m not a huge cracker fan and don’t ever eat them with soup. 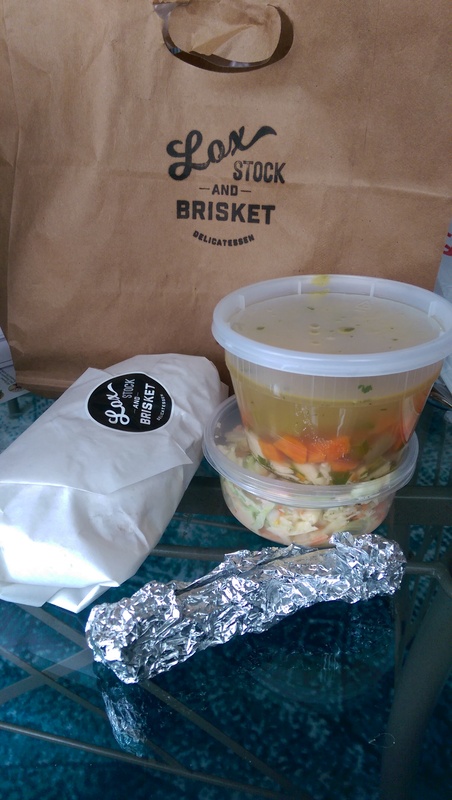 Lox, Stock and Brisket’s lox platter with a Mish Mosh bagel from Bialy’s was everything. The service was great. They definitely made me feel welcome. 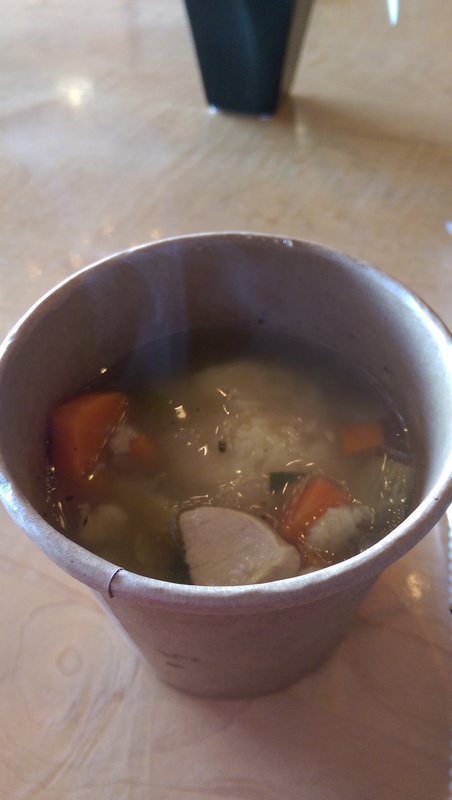 I see myself becoming a regular with quality – and matzo ball soup – this good. Items like brisket, turkey, lox and tuna salad are also available by the pound. I couldnt agree with you more!!!! What a great place, and, luckily for me, I only live about 5 minutes away. Corky and Lennys used to be across the street many years ago. They never did anything half as good as this perfect place!! !